Babblings of a Mommy: Beauty Tip Of The Day: 7 Make-Up Brushes Every Girl Needs. 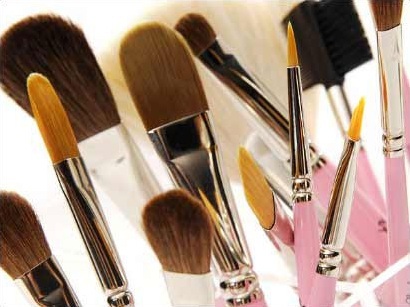 Beauty Tip Of The Day: 7 Make-Up Brushes Every Girl Needs. Ladies, we hear it time and time again--but do we actually listen? Our make-up tools are just as important as the make-up we buy, and when it comes to good make-up application, the make-up brushes we choose make a big difference. Lucky for us, 2 senior make-up artists break down the 7 brushes we actually need in our arsenal. why you need it: This type of brush is amazing for blending and buffing foundation on to the skin. The shape is perfect for a smooth application and will really work to cover pores for a flawless finish. how to use it: It is best used by dipping the brush into foundation and buffing it on to skin using a circular motion. Start on the cheeks and blend back towards the hairline. why you need it: This is a must-have brush for dusting powder on the face. You will use less product than with a puff and it gives a more even, natural-looking finish. how to use it: Dip your brush in powder and tap off excess, then using a sweeping motion, brush lightly over skin following the natural contours of the face. why you need it: A blush brush that is ultra soft and has long bristles, so as not to disturb foundation or irritate the skin is ideal for giving color and life to the cheeks. how to use it: Use the brush to sweep blush and bronzer upwards onto the cheekbones -- from the apple of the cheek up towards the ear. why you need it: This is the brush you need to apply allover eyeshadow color, as it will give your lids a smooth finish and more intense pigment than a fluffier brush would. how to use it: Sweep shadow over the lids from the inside of the eye, outwards. why you need it: This is the ultimate blending brush for eyes, as it can really get into the crease of your eye and define your lid with precision. how to use it: Dip the tip of the brush into your eyeshadow using a circular motion and then tap off the excess product. Then, just using the tip of the brush, start on the outer edge of the eye crease and blend backwards and forwards through the crease using a windshield wiper action. This will contour your eye and work to give you a smoky eye look. why you need it: It's multi-purpose as it can be used on your lashline for eyeliner and your brow to fill it in. Plus it is the most user-friendly of the eyeliner brushes due to its easy-to-maneuver slanted angle. how to use it: To apply liner place the brush on the inner corner of the eye and pressing into the lashline, "walking" the brush across to create a perfect line. Create a winged edge, by simply pulling out slightly past the edge of the eye. For the eyebrows, use it to fill in sparse brows with powder, by using short strokes over your natural brow shape. why you need it: It's the best-shaped brush for a defined lip, and will make a precise lip color application easy. how to use it: After lining lips, cover the brush with lipstick then starting at the center of the lips blend out to edges. Using the tip of the brush, define the edges by using short precise strokes to blend liner and lipstick together. --MAC Senior Artist Louise Zizzo and Landy Dean, makeup artist and brow expert at the Marie Robinson salon.